So the much hyped Internet video project funded by News Corp and NBC Universal finally has a name and launch date. We won't talk too much about what's in the offering in this post. It's the topic for another post. Let's focus on the name. Mediapost published an article, "Hulu's A Lulu Of A Name". The article says, I quote "WHAT'S IN A HULU? IF all goes according to plan, a slew of network shows led by News Corp. and NBC Universal. The long-awaited name for the upcoming joint venture--which means nothing in any particular language--was finally announced Wednesday to an industrywide chorus of yawns and guffaws." WRONG, HULU means something in Chinese, it means snoring (呼噜). Why on earth do you want to watch Internet videos that make you snore, unless you are trying to cure people with Insomnia? Perhaps the highly-paid consultants hired by the project should have checked a Chinese person first before coming up with that name. Six months ago, it was rumored that Universal Pictures would be forgo their HD DVD strategy and support the Blu-ray format. This would have left no major Hollywood studio supporting the HD DVD format exclusively. It is amazing how things can change in six months. Last week, Paramount and Dreamworks shocked the industry by announcing to support HD DVD exclusively. This left only Warner Home Video as the only studio that backs both HD DVD and Blu-ray. With Warner's HD cheif abruptly leaving at the end of September, rumors are now swirling that the company will also make the move to HD DVD. Even though Warner denies a change in strategy, it signifies a dramatic comback by the HD DVD camp. For most of 2007, retail wins and dominance in movie sales have positioned Blu-ray as the front runner. While these HD DVD announcements do not overtake the Blu-ray format, it definitely puts them back in the game. More importantly, it will delay the format war indefinitely. After a couple of months of wins by the Blu-ray format, the HD DVD camp announced some positive news. Paramount and Dreamworks Animation announced that they will exclusively support the HD DVD format going forward. The first title released will be "Blades of Glory" on August 28th. This will be followed by the summer blockbusters "Transformers" and "Shrek the Third". These two movies combined have grossed almost $600 million in the United States. This announcement comes after two significant wins by the Blu-ray format. In July, Blockbuster announced it would only support the Blu-ray format in their stores going forward. Target announced this month that it would only support Blu-ray hardware. While, this is a positive sign for the HD DVD format, the Blu-ray format still seems to be inching ahead. The format, backed by Sony, holds the advantage in disk storage capacity, content support and retail support. Additionally, Sony's decision to include a Blu-ray player with its PS3 has been a major reason for Blu-ray's early adoption. The first $2.5 billion earmarked for the first 70 million pops will be spent before the end of 2008. The next $2.5 billion covering another 25 million pops is contingent upon the success of service. Since the first $2.5 billion is for densely-populated markets, the cost per pop is a lot lower at around $38 a pop, compared to $100 per pop for the next 25 million. Sprint expects $2-2.5 billion in revenue in 2010. Assuming an ARPU of $40 (most likely data ARPU since Sprint wants to keep its cellular network for voice) for a subscriber with a couple of devices connected to the network, Sprint needs to sign up 4.2-5.2 million subscribers before YE 2010. If Clearwire spends the same amount of money per pop for its 30 million pops, they need $1.6 billion between now and the end of 2008. Sprint probably spent some cold hard cash with highly-paid consultant to come up with Xohm, maybe more than they spent on Pivot or Legend spent on Lenovo. The advent of digital distribution for theatrical, television, and user-generated content comes at a time of enormous pressure for the traditional entertainment industry. After enjoying years of strong box office and DVD rental and purchase revenues from the late 1990s into the early part of this decade, growth in U.S. revenues has slowed significantly. After averaging a healthy growth of around 8% between 1996 and 2002, box office revenues haven’t budged since 2003 (and in fact declined nearly 6% between 2004 and 2005 before rebounding 6% between 2005 and 2006). DVD rentals and sales have also lost their luster in recent years. After very strong growth between 2001 and 2004 (nearly 240%), DVD sales revenues were close to flat between 2005 and 2006. DVD rental revenues have also settled into a slower growth rate in 2005 and 2006 – around 10-14% by many estimates. Television networks have similarly struggled with the impact of digital distractions (the Internet, game consoles, DVRs, etc.) that have gradually eroded the primetime audience for many programs (American Idol notwithstanding). Their revenues have been impacted in the form of decreased ad "upfront" ad sales (typically referring to the early buying of advertising for the fall primetime season). In June, The Wall Street Journal reported that upfront sales had rebounded slightly compared to previous years, but television networks continue to reevaluate their ad strategies as major advertisers seek alternative outlets, particularly the Internet. When an online video service such as Joost can land 30 major brand-name companies as primary advertisers (among them Coca-Cola, Nike, and HP), you definitely sense that the rules for traditional media have officially changed. "Internet Video for movie content faces stronger challenges in terms of technological challenges, resistance from major retailers, lack of easy connectivity between broadband services and the television, and the continued consumer reliance on tangible media." Our own consumer data backs the notion that the early successes for broadband video are certainly those efforts more focused on shorter ("snackable") videos, versus a movie download. The good news is that the number of broadband users reporting paying at least monthly to download or stream video doubled between 2005 and 2006 (we compared data from a couple of our studies - Digital Entertainment: Changing Consumer Habits and Digital Media Habits). Five percent of broadband users in Q3 2006 reported paying for video streams and downloads. We're going to be really interested at the results from Digital Media Habits II, which should be available quite shortly. However, consumers active in watching video on the Internet were twice as likely to be downloading short clips (such as movie trailers, news clips, animated cartoons) than longer videos such as feature-length movies or TV shows). The challenges of selling premium video content have been reflected in a couple of significant announcements from the user-paid broadband video space. First, it was announced on August 8 that Blockbuster was acquiring the online movie service Movielink. Now, rumblings about Blockbuster's potential acquisition of Movielink had been around since March, when the purchase price was rumored to be $50 million. In last week's news articles, the purchase price was rumored to be $20. It turns out that both of these price points were off by several multiples. In an August 14 SEC filing, Blockbuster reported that it had purchased Movielink for $6.6 million in cash. For a service that was created from a reported $100 million in investment from the major movie studios, this is one clear sign that a pure movies-on-demand business over the Internet just isn't ready for primetime. The second broadband video announcement of significance came on August 13, when Google dropped its user-paid video services, the Google Video Store. Both of these news items certainly reflect the continued challenges facing the online services, but also opportunities for content developers and distributors. We wanted to share a few thoughts about both of these news items. As a company, Blockbuster’ experience in the video distribution business largely mirrors the opportunities and threats for the industry as a whole. As a movie rental company, Blockbuster’s reach in the U.S. is unparalleled. The company operates more than 5,000 stores in the United States and its territories. In 2006, Blockbuster reported gross profit of more than $3 billion on revenues exceeding $5.5 billion. However, the company’s financials have declined in the last two years. In 2006, Blockbuster experienced a 3.1% decline in DVD rental revenues and an 18% decline in DVD sales revenues. Blockbuster’s core rental business has been under pressure by Netflix, which held a nearly three-to-one margin of subscribers to its online DVD rental service than Blockbuster. Mass retailers, Blockbuster notes, also serve as a threat to its DVD rental and sales businesses because of a movie studio practice known as “sell-through pricing.” This means that the studios release nearly all DVDs to retailers at a price low enough to allow them to entice customers with a small mark-up of the price on their end. For large volume retailers such as Wal-Mart or Target, this is less of a challenge, as they can sell higher volumes of movies than a Blockbuster. For Blockbuster, however, this puts pressure on them. Blockbuster is no stranger to experimentation with online content. In 2000, it announced a deal with Enron and other broadband providers to deploy a video-on-demand service over 1.5 Mbps DSL lines. Needless to say, given the collapse of Enron and the fact that broadband connections were not nearly as widespread nor as robust as they are today, that the effort was shelved. Now, Blockbuster has announced the purchase of Movielink, one of the first online movies-on-demand services that was established by the major motion picture studios in 2002. Blockbuster is perceived as a follower of Netflix. Netflix initiated the online DVD rental business in 2001; Blockbuster began its online DVD rental business in 2004. Netflix announced its digital movie service in January 2007 (and it was commercially available in June 2007); Blockbuster announced its acquisition of Movielink in August 2007. Blockbuster’s brick-and-mortar retail stores are seen by the investment community as both a blessing and a curse. They are a curse, because they account for high overhead. However, recent comparisons of the growth of Blockbuster and Netflix’s online DVD rental businesses indicate that Blockbuster has been experiencing much higher growth in the last year, probably because the retail stores are available for more flexible rental options. Movielink et. al. hasn’t been popular because of restrictive digital rights management that doesn’t provide full flexibility. We'd also argue that the lack of freshness of the content is also a reason. Why use a movie download service if the content isn’t any newer than what one could get via a DVD rental?A more successful model for broadband video is wide distribution of content across multiple aggregators, as opposed to creating exclusive portals. A more successful model for broadband video is wide distribution of content across multiple aggregators, as opposed to creating exclusive portals. An early lesson learned by the TV broadcasters was that - certainly in this early stage - that exlusive portals providing only one source for accessing the content is a non-starter among an ever-fragmented audience. Certain pockets of the viewing audience, including teens and ethnic groups, are already dramatically changing their media consumption behavior. As the viewing audience becomes fragmented, the channels need to diversify. For media companies trying to establish their own online presence, it is essential to define a clear identity for each of their online channels. The Google Video Store was announced in January 2006. This service provided a variety of video, including sports, movies, and TV shows. Google offered these programs for download or rental at prices ranging from about $1 to $20. Although Google's ability to drive revenue from search-generated ads is unmatched, the company - according to critics - struggles in areas outside of this core competency. The Google Video Store was one of these areas. Critics such as David Pogue at The New York Times panned the site its poor design and for not allowing users to play copy-protected content on portable devices such as iPods and notebook computers. Second, Google faced an identity crisis of sorts in providing user-paid and relatively high-value content while at the same time pursuing (and ultimately acquiring) YouTube, which was made famous (or infamous, depending on one's stance) by providing lots of user-generated video and for (in some cases) serving as a clearinghouse for copyrighted content. One could argue that Google's efforts managed to alienate two key constituencies - users who critized a lack of flexibility in enjoying their paid video, and owners of high-value content, suspicious of Google's motives and upset that YouTube wasn't (in their minds) acting quickly enough to squelch the posting of copyrighted content. Google’s own YouTube posed a threat to a user-paid video service. Google is struggling to gain credibility with major content producers, because the YouTube site has come under fire for its use as an illegal distributor of copy-protected content. As in the case of Movielink, consumers struggled to find value with copy-protected broadband video when 1) much of it was free to view (illegally) on YouTube (or peer-to-peer sites); and 2) a DVD can be played pretty much anywhere. Google’s core strength lies in ad-supported Web content, and it has struggled with challenging PayPal with Web payment schemes. This means that advertising will be Google’s “currency” of choice for generating revenues on the Internet. Big news was announced today in the world of broadband of powerlines (BPL). Current Group LLC reached a wholesale agreement to provide braodband and VOIP services under the DirectTV brand name. This partnership marks one of the first deployments of BPL services with a major communications provider. Under the agreement, the services will be available in the Dallas-Fort Worth area by the end of 2007 or early 2008. Current Technologies already is working with TXU to install equipment such as automated meters for "smart grid" services. With this announcement, I can't help but wonder why these two companies are choosing the Dallas-Ft Worth area? The biggest hurdle I see for Current and DirectTV is competition. They will have to compete with cable MSOs Charter and Time Warner. They will also be battling fiber and DSL services from Verizon and AT&T. Details on what Internet speeds will be available have not been announced. However, it will be very difficult for this BPL solution to compete on the basis of speed. It is assumed that Current and DirectTV will compete as a low price alternative. It is interesting that this populous market was chosen. For years, one of the main selling points of BPL was the possibility to provide broadband services to areas that cable and telcos have not penetrated. With satellite being a popular chose for video service in rural areas, this seemed like a logical broadband strategy to pursue. We will see if this new partnership will begin to expand to rural areas in the future. It’s interesting to see how our Managing the Digital Home: Installation and Support Services and Digital Home Services: Carriers, Retailers, and the Consumer continue to have legs and lead us into new and potentially interesting areas. Since we released the Digital Home Services report, I've been contacted by some new companies of which I was previously unaware that are involved in the comparison shopping side of the business. Specifically, I've spoken to reprsentatives from companies like Acceller, GetConnected, and retrevo. These companies represent and area of “digital home services” that I hadn't previously considered – comparison shopping for services and products. However, it's clear why these type of services are important. Purchasing digital convergence products has become a complex task with many confusing options and emerging technologies. Gone are the days when a customer could research and buy a product based on basic parameters such as screen size, form factor, and color. Convergence (digital camera to home computer; audio receiver to high-definition set-top box, etc.) now requires the customer to feel comfortable about such topics as connections, digital interfaces, and interoperability. Therefore, it is not enough for consumers to simply know that a product exists; they also will be required to have a good degree of comfort in understanding how the product works. Reaching this level of understanding will require additional research on their part and speaks to the enormous impact that “influencers” will bring to the purchase process. Moving beyond the “friends-and-family” knowledge connections that we all have, consumers are likely to be drawn to reliable resources for product reviews, comparisons, and buyer’s guides that help walk them through the initial phases of the buying process. It’s pretty interesting how these online comparison shopping services are working with service providers and using some psychographic profiling of online users to determine how best to market services such as high-speed access, high-definition television, phone, and high definition. I think we’ll hear more from these companies as the service provider space gets more crowded. There’s also a growing product presence through these sites. The companies are talking about posting peer reviews and advice and assistance with new products. The services are also talking about ways to link to professional services such as Geek Squad, firedog, and OnForce. So, it looks to be quote holistic in not only selling products and services, but also enhancing the experience with hand-holding and other support. So, add this comparison shopping service to the ever-evolving concept of the customer support lifecyle (see the as the image above illustrates). As you'll notice, buying assistance is an opportunity at not only the time of the initial purchase, but we also feel that it'll be an opportunity for service providers, retailers, and consumer electronics manufacturers even after that first purchase. A key realization for solutions providers in this space is that carriers and equipment vendors as well as other third-party players (remote IT support organizations, for example) need to understand the basic parameters of the digital home. At present, these entities are largely flying blind when it comes to knowing which devices are connected on a home network and how they are being used. With remote diagnostics capabilities and two-way reporting to a “knowledge database,” carriers can benefit from more timely information about the configuration and use of digital home products and provide more proactive service if their customers have problems with equipment or services. Furthermore, the value of the knowledge database can be extended as consumers seek to add more devices to their home networks. In addition to recommending fixes, the database can be used to generate recommendations for compatible software, hardware, or equipment. For example, the carrier may build internal case studies that would indicate that Wireless Bridge X works particularly well with Game Console Y, and could recommend such a product when the customer is ready to link his or her game console to the broadband connection for online gaming. We certainly envision a near- to longer-term future in which diagnostics and troubleshooting clients are actually used to provide consumers with much more in the way of holistic digital home support, including advice and suggestions for new product and accessory purchases. China's broadband market is still growing rapidly, despite the recent deacceleration of growth rate. In June 2007, the MII reported more than 59 million broadband users in China. XDSL has more than 75% of the market and the two major telecom operators, China Telecom and China Netcom, has 95% of the market share. Cable operators have not been a competitive force due to various reasons including regulatory issues. This might change in the near future. According to officials at SARFT (State Administration of Radio, Film, and Television), they are exploring two-way interactive cable technologies, which definitely would include cable broadband. China's cable TV penetration is now at 35%, with 130 million subscribers. This large installed base can potentially become a gold mine if cable operators are allowed to offer broadband services. As telecom operators in China deploy their IPTV services (currently with more than 600,000 subscribers), cable operators will need to find a way to become more competitive. China's two regulatory bodies, SARFT and MII (Ministry of Information Industry), have been fighting against each other for years. When telecom operators started their IPTV deployments, SARFT strongly opposed their entry. Since China does not have one agency in charge of communications and entertainment industries, like the FCC in the U.S., such conflicts will continue in the near future. In addition, the government has investment in both TV and telecom operators and officials need to constantly balance the need for competition and the possible repetititve infrastructure construction (considered wasted resources). Because of these factors, it may take years for cable broadband technology companies to benefit from a potentially large market. Club Penguin, the popular virtual world targeting 7-15 year old, is now Disney's Club Penguin. The Walt Disney Company announced that it will acquire Club Penguin for $350 million hard cold cash, with another $350 million in sight if the company meets performance expectations. At 700,000 users, that's $500 a penguin. To put the number in perspective, Murdoch bought Myspace for $28 per user ($580 million divided by 21 million users at the time of acquisition). If we consider activated user account instead, it's a little over $29 per account based on 12 million accounts (many users have multiple accounts). Of course, the valuation is based on growth potential, or the so-called castle in the cloud. Club Penguin did have a 300% YOY growth according to Hitwise. Judged from all angles, it's not a bad deal for the three canadian fathers who set up the site a couple of years ago, not a bad deal at all. When I became a father in 2005, I heard new parents lose 10-20% of their IQ. Apparently the same thing did not happen to those three lucky guys. 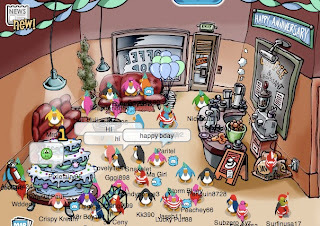 Club Penguin did not invent virtual world or avatar-based social network but it was successful at targeting its audience and monetize its users. It combines premium subscription ($6 a month) and microtransaction. Kids can purchase both virutal and real-world merchandise within the game. For instance, they can buy furnitures to decorate their space or T-Shirts to wear to school. Such ideas are nothing new. Cyworld, the South Korean sensation pioneered the concept in 1999. 96% of Korean youth are on Cyworld and it is expected to generate $150-250 million for SK Communications, its parent company. People have doubts whether those cutesy avatars will work in North America. Cyworld did make its U.S. entrance in 2006 but it's unclear whether the company will meet its target of amassing 2 million users by the end of 2007. Apparently Disney believes in the model. Virtual Worlds have been the media sensation for the past 12 months. There were tons of news articles on everything related to Second Life, including a recent one pronouncing the death of Second Life on Wired Magazine (It does not seem that the article had any impact on the valuation of Club Penguin). However, it's the less known worlds, such as Club Penguin, Habbo Hotel, Runescape, and Webkinz, that are making real money. Virtual World is here to stay, even if Second Life dies. At Connections 2006, I posed the question to the audience, will Virtual Worlds become the new model for social networking? Large corporations might be exiting Second Life, but they are setting up their own branded virtual worlds instead. MTV set up Virtual Laguna Beach and Webkinz, a site owned by Ganz, is making those fluffy toys fly off the shelf. Disney itself has also set up virtual worlds such as Virtual Magic Kingdom. We expect such Branded Virtual Worlds to become even more popular in the coming years and in our recently published report on game advertising, we actually forecasted the growth of advergames and adverworlds. It's funny that Disney said there won't be any advertisements in Club Penguin... It's a giant adverworld afterall. This deal leaves me wondering, what's next? McDonalds buying Habbo Hotel? Sony buying Runescape? BT Home IT Advisor - a Model for Service Provider Home IT Support Services? "Although broadband service providers have not to date taken an active role in directly offering a remote support solution to their customers (relying instead on a third-party vendor), we are intrigued by the recent launch of BT’s (UK) Home IT Call services. The Home IT Call service includes premium telephone support for broadband, networking, and basic PC issues. It has now been augmented with an in-home technical support service (Home IT Visit). Home IT Call has two payment schemes – a £9.99-per-month subscription and a £25 per-case service. We are told that the service is 'flying out the door,' but BT has not revealed any specific subscriber numbers." Now, BT has actually revealed some information about the take-rate for the service. As of May, BT notes that it has 40,000 customers, and that it is taking customer orders at a rate of 2,000 per week. Further, the company notes that the Advisor service has a 96% satisfaction rate among users. Another interesting feature that BT is providing is the BT Digital Vault, which gives broadband users an online store for their online movies, music, photos and documents. The company reports that it now has more than 125,000 registered users.